The Lemosho route is the most unspoilt and remote way up to the Shira Plateau where you will then join the Machame Route. You may need to be accompanied on the first day by an armed ranger, as the forests around the Lemosho Glades are home to buffalos, elephants and other wildlife. On the Summit day you will rise around 23h30, and after some tea and biscuits you will set off into the night. You will head in a northwesterly direction and ascend through heavy scree towards Stella Point on the crater rim. This 6-hour walk to Stella point is for many climbers, mentally and physically the most challenging part of the route. At Stella Point you will stop for a short rest and will be rewarded with the most magnificent sunrise you are ever likely to see (weather permitting). From Stella Point you will normally encounter snow all the way on your 2-hour ascent to Uhuru Peak. The time you will spend on the summit will depend on the weather conditions. Do not stop here for too long, as it will be extremely difficult to get going again due to cold and fatigue. The walk back to Barafu from the summit, takes about 3 hours. Here you will have a well earned but short rest and collect the rest of your gear, before heading down to Mweka hut (3100m). On the last day you will have a 4 to 6 hour scenic hike back to the Park gate. At Mweka gate you sign your name and details in a register. This is where successful climbers receive their summit certificates. 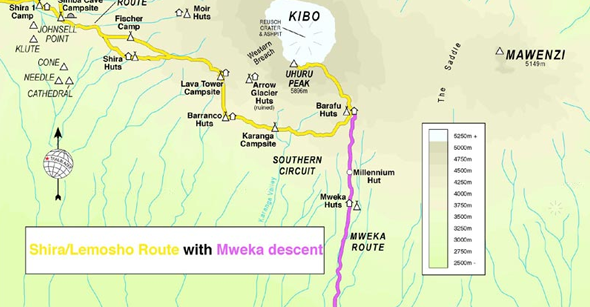 Those climbers who reached Stella Point (5739m) are issued with green certificates and those who reached Uhuru Peak (5895m) receive gold certificates.From the Mweka Gate you will continue down into the Mweka village, normally a muddy 3 km (1 hour) hike. In the Mweka village you will be served a delicious hot lunch before the drive back to Arusha for a long overdue hot shower, dinner and drinks. The above tours include: Park Fees, Transfers to and from the Airport, Breakfast, Lunch and Dinner whilst on the mountain, 2 nights at the Medium Hotel in Arusha/Moshi.